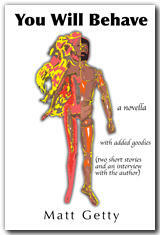 "You Will Behave" was accepted yesterday by a Las Vegas literary magazine called Rainbow Curve. They tell me it should be in the next issue which is due out in October 2004. This is a story I started writing in 2000. It came sideways out of two conversations with Henry Taylor, who said something to the effect that any writer worth his salt would immediately try to do something that a teacher or editor told him couldn't be done. In a subsequent conversation about the use of the second person in fiction and an RHW Dillard novel called The First Man on the Sun which is told entirely in the future tense, Taylor then indicated that he felt a novel told exclusively in the second person future might be impossible. So that's what "You Will Behave" is--A 6000-word story in which the narrator (the mother) addresses the main character (the son) with an admonishment that extends into ridiculous predictive and prescriptive life story. Sort of twisted take a bildungsroman born out of the sick mind of an over-protective mother. Since this story moved from draft to story long before the launch of this blog, I will attempt to describe its drafting process in another posting. Maybe I'll also post some PDFs of any old handwritten drafts that I have lying around. Oh -- here's an idea, I'll also post my correspondence(s) with Rainbow Curve leading up to the story's publication.